was this an 8 ball? no, just the very unusual occurrence of someone waving through the match behind…………. Ken Saunders won this week’s Apollo Air (is he now Apollo Creed? ), leading from the front. He was first out with Neil and they both held their positions at the top of the leaderboard until the end. Conversely, Kim went out last and finished first! I had to go to the UK (out Friday, back Saturday) so couldn’t play – I managed to get a couple of photos before I left, and amazingly had 3 of the winners on them. Would have rather been out there than stuck on the M1 car park! Ken putts out on 16 closely watched by Neil……………..
Kim sets off on the back 9 determined to overtake Alicia……….and she did! Next week is the Barry Answer special event, times are filling up fast but check for your definite time after the Wednesday night meeting as times have changed. The party will be in the Condado Club at night with entertainment. 38 players made up 19 teams in this week’s betterball competition, and there were some high scores. Kam Cheema maintained her good form from winning last week’s ladies championship along with partner Paul Coopey, just pipping Ken and Alicia Saunders to 1st place on a back 9 countback. runners-up were Ken & Alicia………………..
45 pts may usually be enough but only good enough for 3rd this week ……………..
Eddie Doubtfire in action ………….. There were noticeable changes to the course condition this week……. the lake on 13 was practically empty, whilst the water level on hole 4 had risen considerably, although still below the level of the liner. Also the state of the bunkers still left a lot to be desired, although the greens staff did seem to be working on them albeit behind the players in the competition. Some of the fairways and tees had improved though, with stripes adding to the beauty of the course. the 10th is looking good, and the staff are hard at work in the bunkers………..
the 14th tee is nicely striped……………..
Neil found machine tracks and footmarks in this bunker on 9……. the water on hole 4 is much more evident……. but now 13 is almost empty……………..
Next week is the September Apollo Air individual stableford, followed by the Barry Answer special event on October 2nd. Below is the post received from Aguilon golf regarding their Ryder Cup qualification. This years annual match will take place over the weekend of 7th& 8th November, featuring a team of U.K. (and rest of Europe) golfers and the team representing Spain, the format being pairs betterball on Saturday and Singles Matchplay on Sunday. The format is Individual Stableford with the player having the choice of tee to play from I.E. White, Yellow Or Blue for men and Blue or Red for ladies. When your choice is made ALL players MUST use their exact handicap and then apply the relevant slope handicap of the tee chosen. The top 28 scores in any of the three rounds will qualify for the U.K. team. The costs are as follows: to play in one qualifier for non-members it will be 25 euros including buggy, for those who want to play in 2 or 3 qualifiers, the cost of the second and/or third game will be 15 euros inc buggy. All cards must have “ryder qualifier” and be signed showing the tee played from and exact handicap and slope handicap and left with the caddymaster. For those of you wishing to book tee times please contact ME at this email address, NOT the club. For those lucky enough to qualify the cost over the weekend of the 7th & 8th November is 35euros for non members and 25 euros for members, this includes the two days golf inc buggy, a team polo shirt and a bar-b-que after the presentation. Sheets for all 3 dates are posted on the society noticeboard in the clubhouse. The team for UK & Ireland has been finalised. The team is as follows. No extra day’s play on the Monday – shotgun start 09.30 Tuesday October 20th. Cath and the sponsors along with this year’s winner, Kam……………. We eventually managed to get 8 ladies to compete for this year’s Ladies Day trophy. The players involved though were some of our best, and it was assured that we would finish with a worthy champion. In the end Kam Cheema just held off the challenge of Sue McLellan by a single point. In addition, 36 men took part in an individual stableford. The competition was sponsored by Condado Laundry, thanks for the substantial financial input which provided the many prizes. You can find the laundry in the Condado Club building. Ken Saunders plays his 3rd to the 13th green…….from 500 yards away!………. Sissel looked happy with 3rd place………..
had to put this one in…… reminds me of the fairy story when the princess kissed the frog………..
Paul won the men’s 1st division prize…………..
President Dave Rollett took the 2nd division prize……………. thanks to Alicia and Kim for organising the evening and the non-golfer’s competition…………. a long time since Borre got his photo on the blog………..
and here he is………….he said he was a tenor, so we offered him that to sit down………..
of course Dave had to get up……..guess what he sang…………. looks like Kev and Dave’s lullabies worked……….or maybe his pills have kicked in……….. The storms of last week have replenished the lakes, although it seemed that water was also being pumped into the lake on hole 11 (maybe from the 13th which is still very low). The greens were in fantastic condition, the fairways were good, but the first cut of rough was very penal – a big advantage to staying on the fairway. after the rains of last week ALL the bunkers should have been G.U.R………..
Late news……….Geoff Hill won the 1st category IRM competition at El Valle on Saturday. Well done Geoff! Geoff is presented with his category one trophy at El Valle…….. Thanks to Chris King and Dave Lloyd for sending in the photos. The next big event is the Barry Answer trophy on October 2nd (get your name down). We are desperately short of lady golfers for the Cath Emmett-Smith trophy to be played on Friday. If you can join us please contact bookings@cdagolf.com or put your name on the sheet in the golf shop. Last time for entries is 7pm – 8pm Wednesday in the Clover bar. also we have exclusive use of Bar Med in the port on Friday night, with our own entertainer. 15e for the 3 course meal and 5e return on the coach. Contact events@cdagolf.com or come down Wednesday night. There many great prizes in this event which is sponsored this year by Condado Laundry. Non-golfers are also welcome to join in a fun putting competition on the practice green at 1pm Friday – cava and nibbles provided, and meet other ladies who like fun and can meet new friends. last year’s winner Fran Hobson………..
Jim was presented with a momento for his hole in one…….. Finally a bit cooler today, perfect golfing weather for the 44 players (11 teams) in the team event, with 2 to count on holes 1-6, 3 to count on 7-12 and all 4 to count on the last 6 holes. Congratulations to Jim Hershaw who aced the difficult par 3 7th hole – although they didn’t see it drop, it was time to celebrate when they looked in the hole! It certainly helped them to become the winning team. 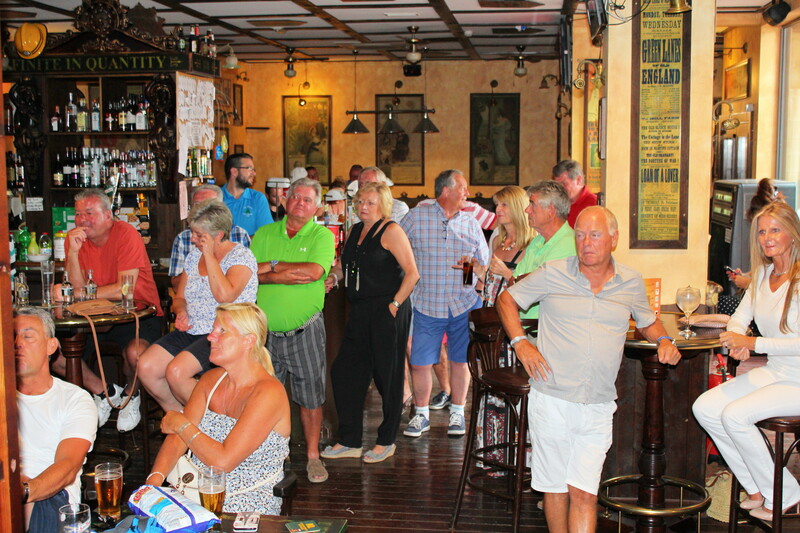 the golfers gather in the Clover bar to find out who has won……. Jim, Diane, Neil and Mike were this week’s winners…………..
Tickets 15 euros at Bar Med at Mazarron ( plus 5 euros on the bus if required). It leaves at 7pm and returns at midnight. We will have exclusive use of the terrace along with the entertainer. If you want to go, email events@cdagolf.com or if you are here see Alicia or Kim.